I had been sluggish and dormant for the past days because the weather is cold (15 degrees celsius! ) and that scared me to go out let alone to go jogging. But yesterday, I made up my mind to get a little bit active so we walked along Doha Corniche. Doha Corniche is a 7 km long waterfront promenade that is lined with palms (are they dates?) surrounding the Doha bay. We walked for more than 3 kms starting at the other end and finishing at Kabayan supermarket located at the Souq. That made me so tired and I was begging my husband for us to go home. You see, when we were in Singapore the shortest distance I can walk/jog is 4 km, Frederick often times do more than I do, so 3 kms should be no problem for me. But then again, I had been lethargic, so even if we walked leisurely, I got tired like I walked for more than 10 kms :-( and I don't feel like going to any supermarket. But the moment I saw the crabs at the Kabayan supermarket, I got excited and energized. The thought of having a crab for dinner stimulated my gastric juices that I can hear my tummy growling so loudly in excitement. Frederick also insinuated that he likes laing for supper. 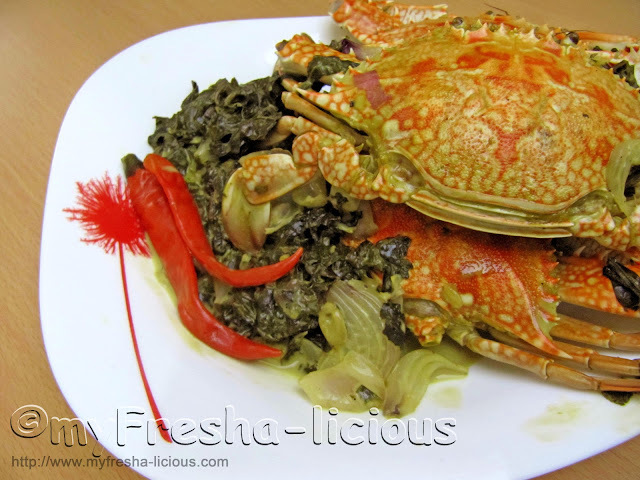 So there we agreed to have laing (taro leaves in coconut milk) with crabs. But then again, the thought of me cooking laing is daunting. I hesitated to cook laing because the last time I cooked the dish when we were still in Singapore was really disappointing :-(. My husband volunteered to cook laing with the crabs for our supper last night. The result? It was truly delicious. My goodness. I ate more than my tummy could handle. It looked so mouthwatering and it tasted even more wonderful. The laing he cooked has a creamy sauce in it and not the dry type. The sauce was so savoury, creamy, and just a bit spicy. And the texture of the taro leaves are smooth, almost silky (not the silky slimy texture of saluyot / jute leaves). Love it so much. Laing is originally a Bicolano spicy dish that is made of taro leaves cooked in coconut milk. 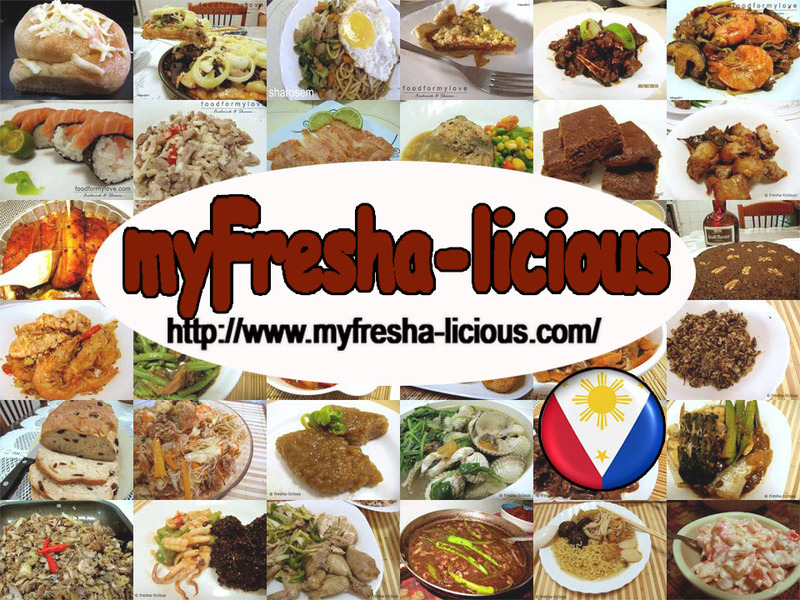 Seafoods, fish, and pork are usually added. Ilocanos like us have our own version of this dish which we call ginitta-an nga aba (taro, which includes the tubers and the stems of the taro and its young leaves, cooked in coconut milk) see ginitta-an nga aba for the recipe. Taro Leaves, dried and shredded- 30 to 50 g.
1. 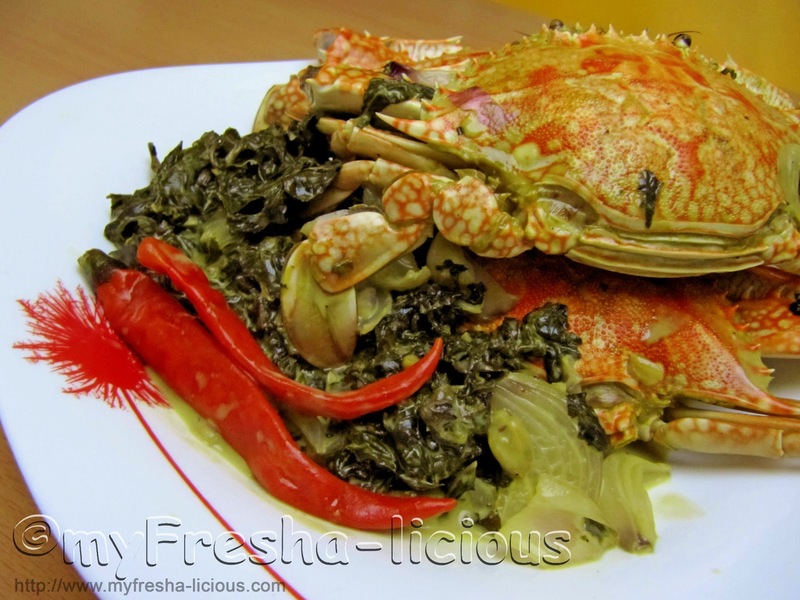 Place the crabs in a pressure cooker and cover it with water. Bring them to a boil under pressure for 5 minutes, timing it from the moment the pressure cooker whistles. Remove the crabs and set aside the broth. 2. Dissolve the coconut milk powder in a half cup or less of tap water. You can also use the crab broth as long as it cooled down. Set aside. 3. Heat the oil in a pot then sauté the garlic until it turned brown then add the onions and the chilli peppers. 4. Add the dissolved coconut milk and 1 1/2 cup of the crab broth. Bring to a boil. 5. Add the taro leaves and let it simmer until the leaves wilted. 6. Throw in the crabs and the quartered onion. Bring the stew to a simmer for at least 5 minutes. Remove from fire and serve with your favorite white rice.